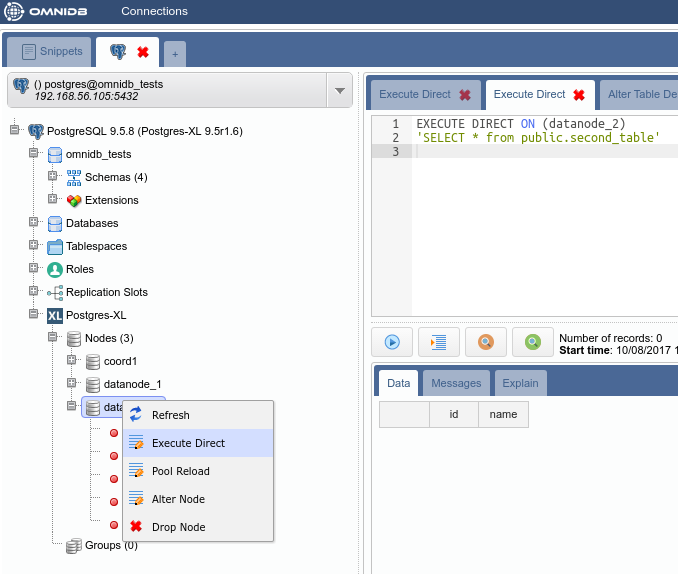 Postgres-XL (or just XL, for short) is an open source project from 2ndQuadrant. It is a massively parallel database built on top of PostgreSQL, and it is designed to be horizontally scalable and flexible enough to handle various workloads. Here we will show how to build a test environment to play with XL and how to configure it using the OmniDB 2.2 web interface. For this test environment to work, you need to put both machines in the same internal network. If necessary, you can edit IP addresses in files Vagrantfile and bootstrap.shlocated inside the folder of each machine. You also will need to replace the IP addresses on the file bootstrap.sh for all machines. At this point all machines are up and running a Postgres-XL node on each one of them. But the nodes does not know about each other. Besides, every node thinks it is a coordinator. So we need to connect to each node, alter its type and inform it about the existence of the other nodes. psql -c "ALTER NODE coord1 WITH (TYPE = 'coordinator', HOST = 'localhost', PORT = 5432)"
psql -c "CREATE NODE datanode_1 WITH (TYPE = 'datanode', HOST = '192.168.56.106', PORT = 5432)"
psql -c "CREATE NODE datanode_2 WITH (TYPE = 'datanode', HOST = '192.168.56.107', PORT = 5432)"
psql -c "ALTER NODE datanode_1 WITH (TYPE = 'datanode', HOST = 'localhost', PORT = 5432)"
psql -c "CREATE NODE coord1 WITH (TYPE = 'coordinator', HOST = '192.168.56.105', PORT = 5432)"
psql -c "ALTER NODE datanode_2 WITH (TYPE = 'datanode', HOST = 'localhost', PORT = 5432)"
Finally we have a working Postgres-XL cluster. And it is very nice, because there are separated virtual machines for each data node. 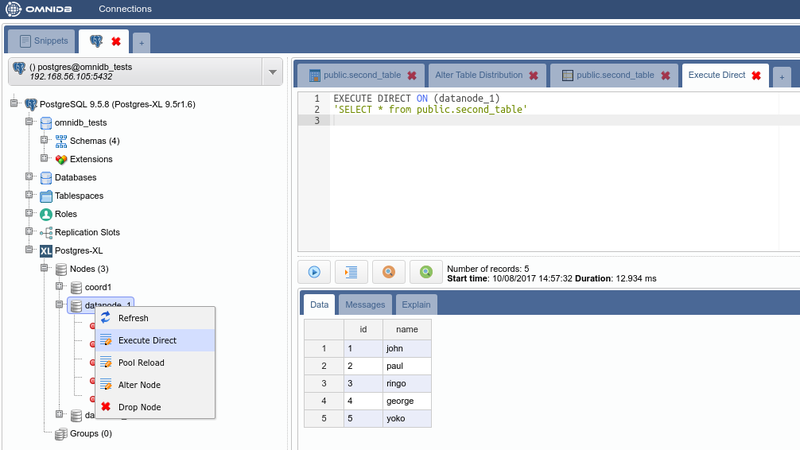 psql -c "ALTER USER postgres WITH PASSWORD 'omnidb'"
psql -c "CREATE DATABASE omnidb_tests"
Then click on the Test Connection action. 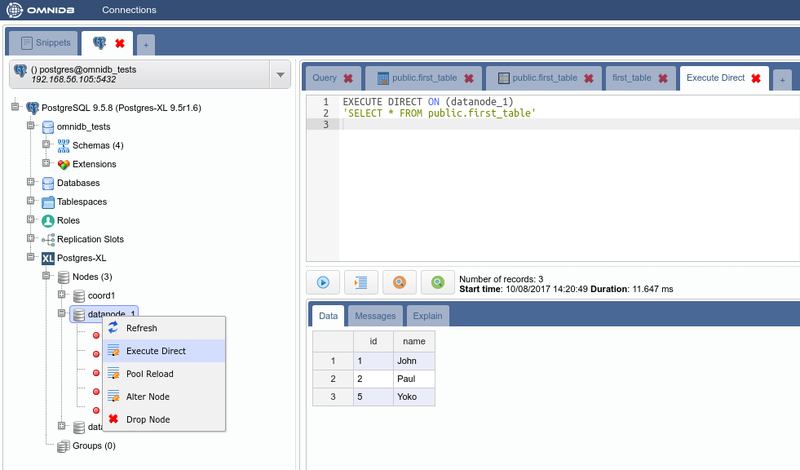 You will have to type the password of the user postgres, which we set above as omnidb. After that you can click on the Select Connection action. When done, click on the Save Changes button. 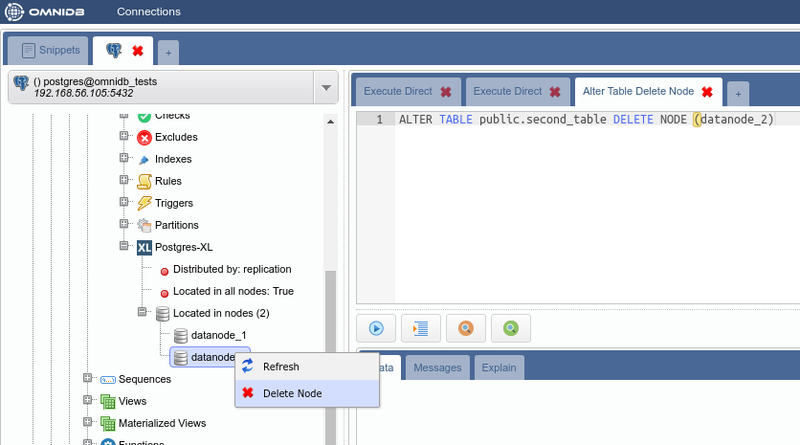 Now right click on the Tables node and click on Refresh. You will see the new table created. 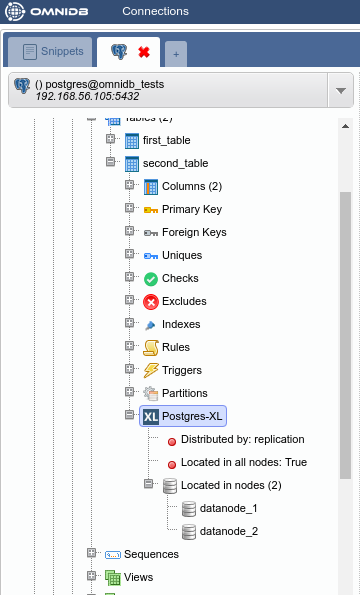 Expand it to see that there is also a Postgres-XL node inside of it. Check its properties. 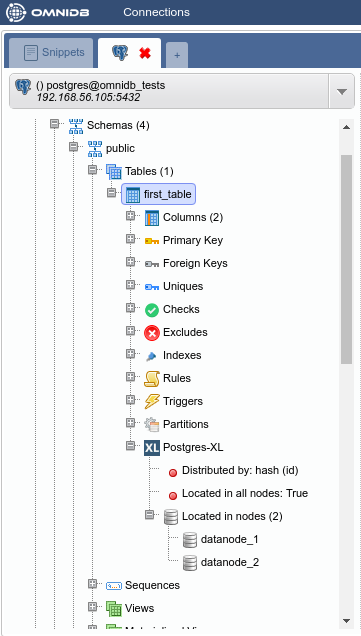 By default, Postgres-XL always try to create a table distributed by HASH. It means that the data will be split into the nodes regularly, through a hash function applied on the specified column. If present, it will use the primary key, or a unique constraint otherwise. 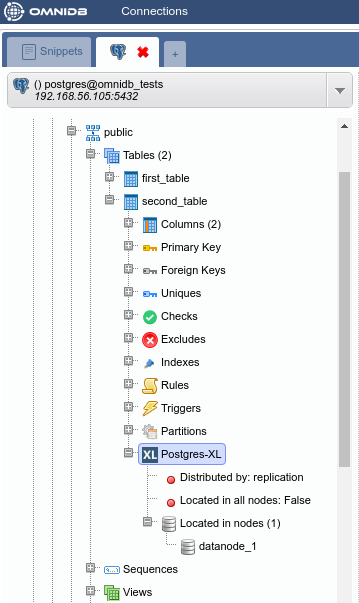 If there is no primary key nor unique constraint, Postgres-XL uses the first eligible column. 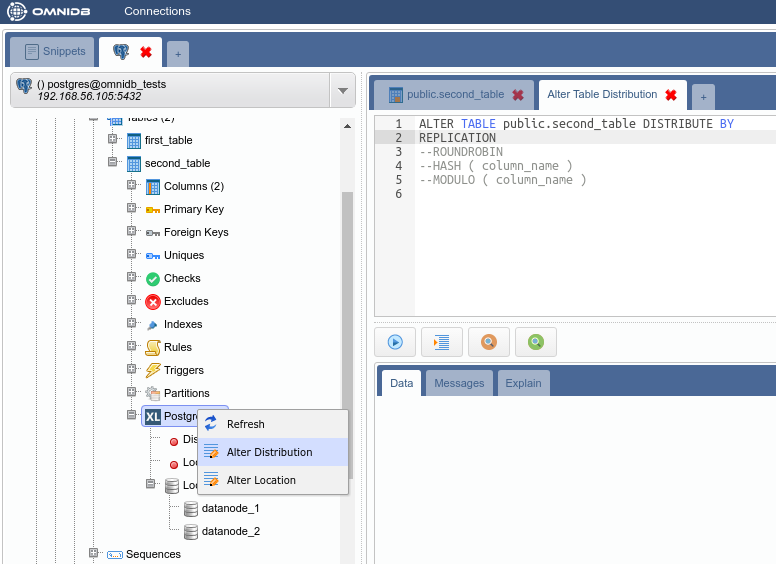 If not possible to distribute by HASH, then Postgres-XL will create the table distributed by ROUNDROBIN, which means that the data will be split in a way that every new row will be added to a different data node. 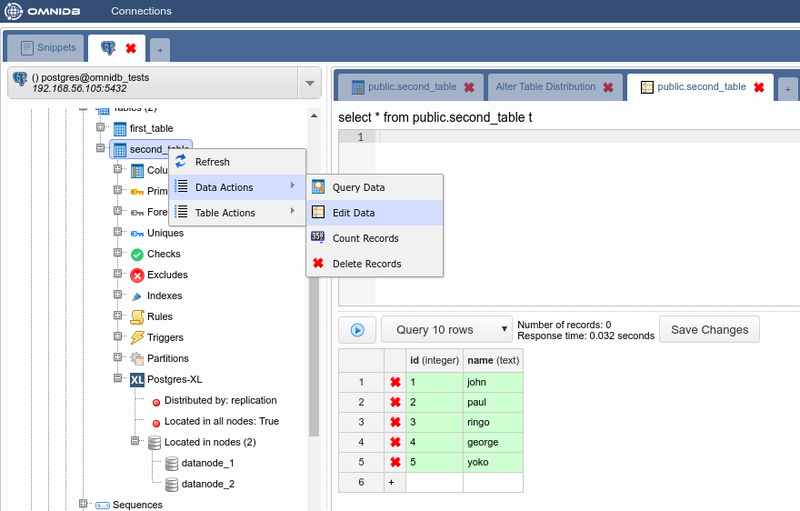 Right click on the table again, Data Actions, Query Data. 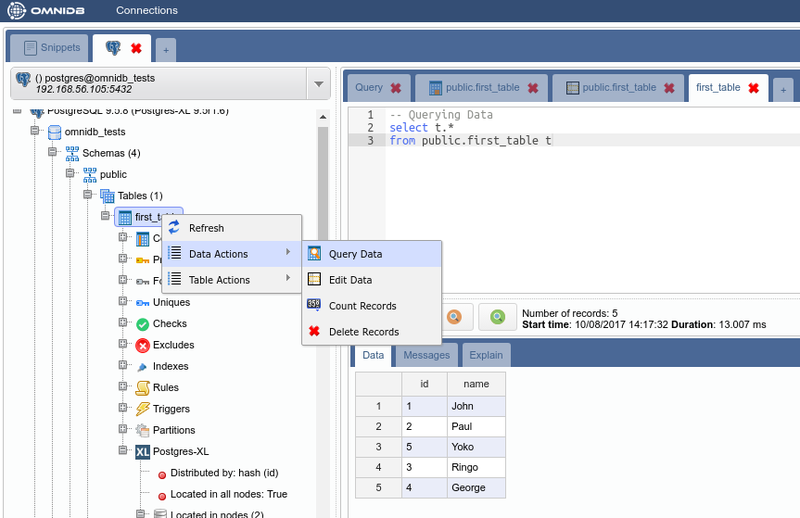 You will see that cluster-wide the table has all data inside. But how the data was distributed in the data nodes? 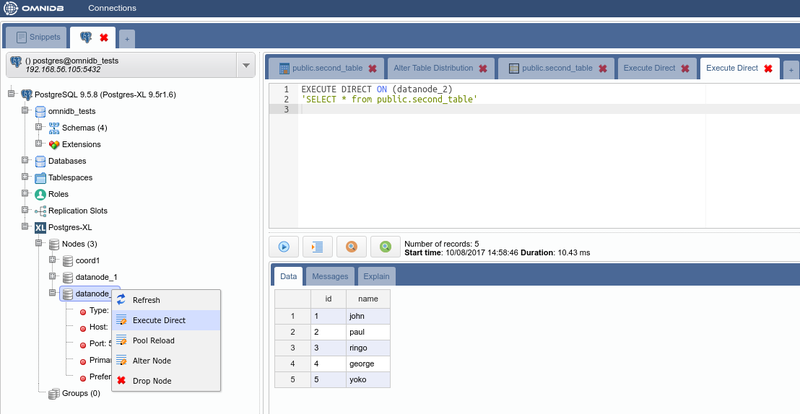 In the Postgres-XL main node, right click on each node and click on Execute Direct. 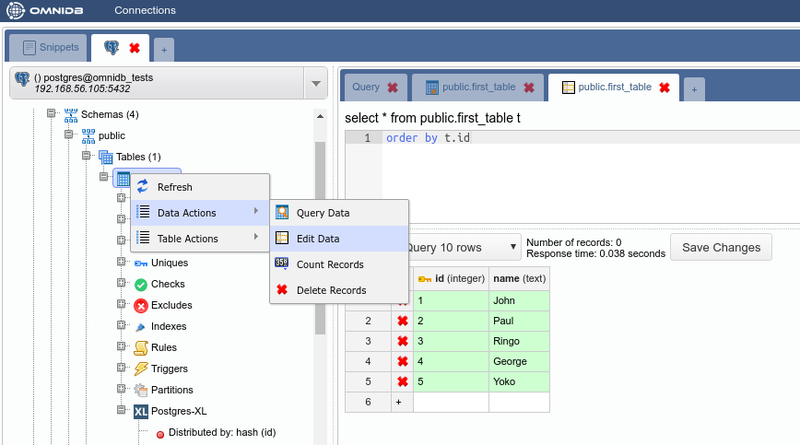 Adjust the query that will be executed directly into the data node, as you can see below. While HASH distribution is great for write-only and write-mainly tables, REPLICATION distribution is great for read-only and read-mainly tables. However, a table distributed by REPLICATION will store all data in all nodes it is located. You can check the distribution was successfully changed by right-clicking on the Postgres-XL node and clicking on Refresh. The properties will now show Distributed by: replication. Sometimes you do not want that a table keeps storing its data on a specific data node. One reason for this is to free up some space on the data node disk. 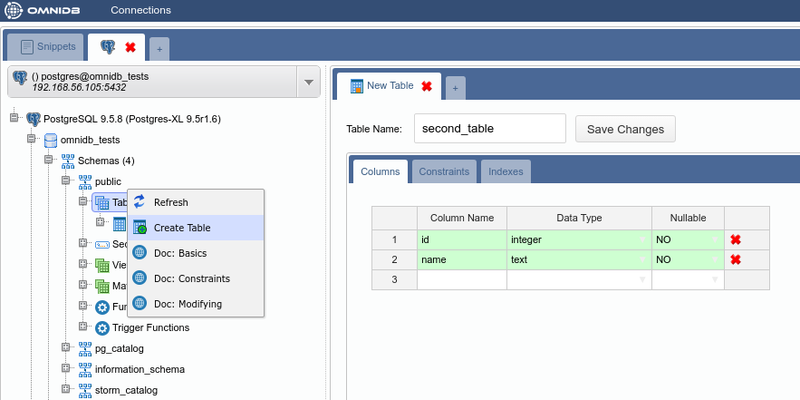 Let us remove data for the second table from datanode_2. 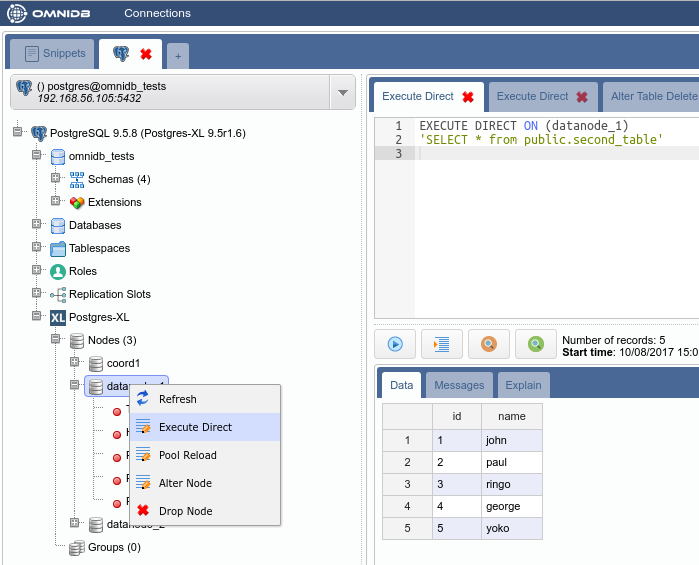 In the Postgres-XL node inside the table, expand the Located in nodes node. 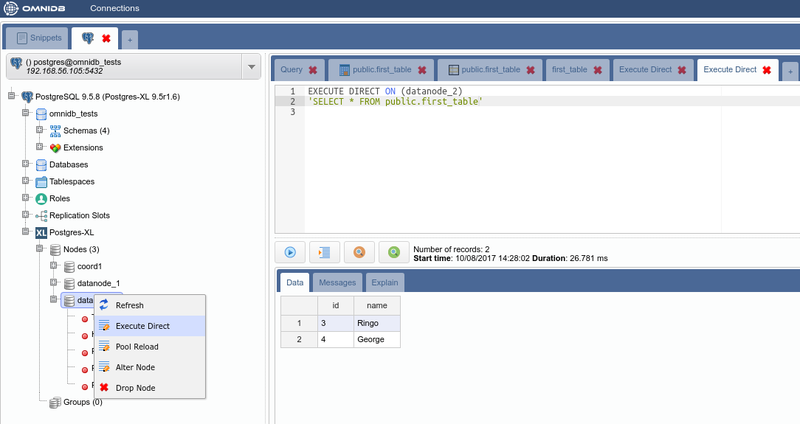 Right click on the datanode_2 node and then click on Delete Node. 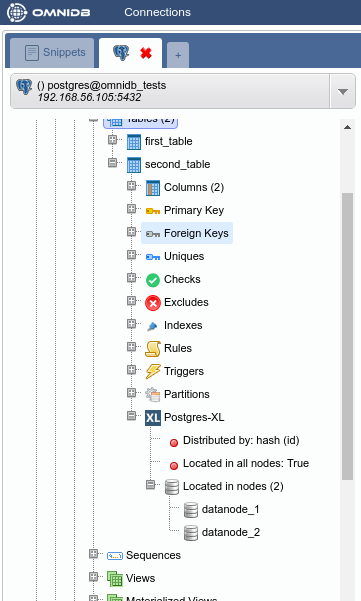 Bear in mind that this will not delete the node; this will delete the table data from the node, and future data will not be stored in this node anymore. 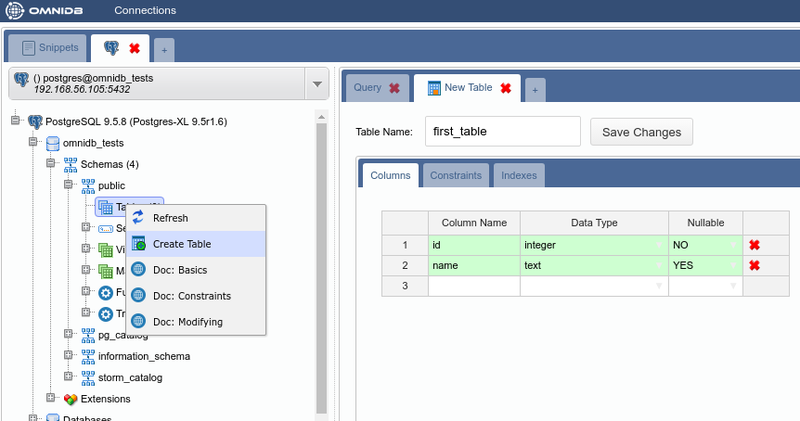 Refresh the Postgres-XL node inside the table to confirm the change.